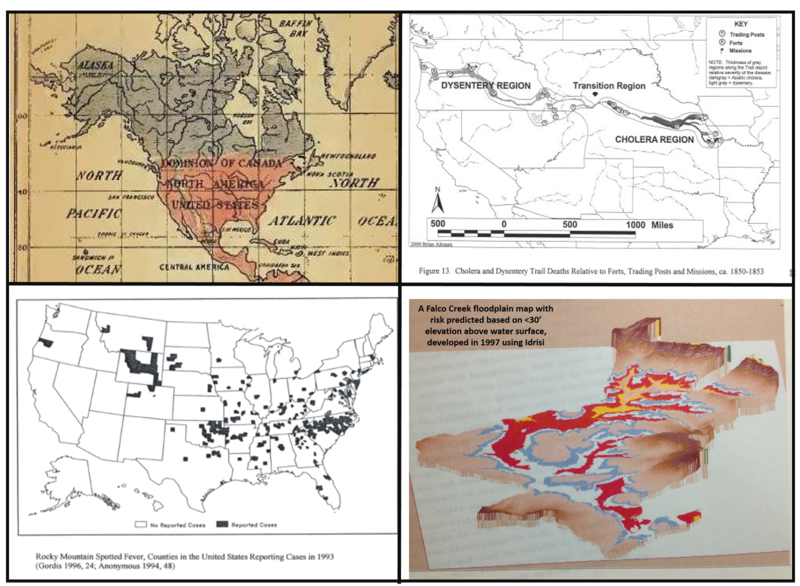 Health Information Technology-Geographic Information Systems or HIT-GIS is the name I have given to a healthcare information system that is focused on spatial epidemiology and population health analysis, with the goal of improving the current healthcare system that is operating. The electronic medical record (EMR) was defined several decades ago as the attempt to keep patients’s health histories in one place, where they could be accessed years later and from different locations. The potential impact such a system might have on health care was first discussed extensively at a conference in New York City, when corporate and government defined and driven health maintenance organizations were first being developed. EMRs serve as the main framework for producing a productive and useful health information technology [HIT] system. The EMR-HIT in turn puts medical and personal patient records data in order, in such as way that comparisons can be made between people who can somehow be grouped together. Those groups in turn can be contrasted and compared with other health groups, and the various aspects of care in terms of patient’s health, patient’s health improvement, patient’s services, and patient’s cost for these services can be compared. Similarly, the quality of service and need for services can be evaluated for different physicians or care givers, different physician groups, different businesses, office and facilities, and different programs managed by the various unions, companies and large scale health insurance companies. To date, due mostly to corporate and institutional resistance, an effective EMR-HIT system has only been developed at a fairly simplistic or rudimentary level. 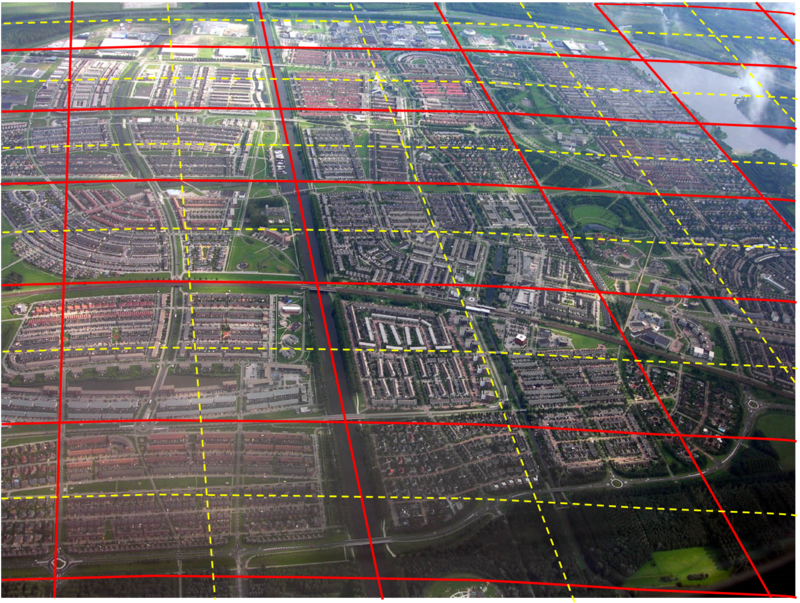 The HIT-GIS is the next generation of this information technology. The transition of EMR and HIT into a combined structures, non-structured data analysis system capable of machine generated analyses is parallel with the potential transition of HIT and its EMR into an HIT-GIS system in which the data (structured and non-structured) are analyzed, and them mapped. I developed an HIT-GIS system and process for storing, managing, analyzing and reporting on all forms of health and healthcare related data. By analyzing the details of an exceptionally large, big data, health care service related data warehouse setting, I’ve been able to establish some rules and methods for quantifying the mass amounts of data being acquired and incompletely tested. The sections attached to this page go through my logic and method for reviewing EMR-HIT and potentially valuable HIT-GIS data. NOTICE: This site is a work in process. More examples of this Mapping Technique that relate to the current health news are posted at Pinterest. These videos are also available at YouTube and at specific pages, the links for which are posted throughout this website.………………. The most accurate interpretation of people, health and the cost for health care delivery based upon time and space. The only way to effectively monitor population health is to engage in prevention first, therapeutics second, and cost related concerns third. Currently, there is no program out there like my National Population Health Grid [NPHG] program. It allows you to determine the intensity and specific locations for public health issues at the neighborhood and community level. It also makes it possible to test, validate, map, and demonstrate how health is being practiced at the public health level, the demographic level, the health insurance coverage level, the local finances and economic level. Most other health professional teams, groups and specialists have developed uses of spatial analysis. In fact, nearly all of these teams have reached that higher level of intelligence defined by using a system that can be used to generate predictive models for health care, not just reflect upon and try to explain the past. Big Data companies have the ability to accurately review data like that for health at the point level–right down to the millionth degree of plant earth’s surface. Yet big businesses rarely go beyond state down to county levels of mapping data. In health, the NIH and other Health overseers do everything possible to prevent potential HIPAA violation practices from becoming a part of the disease and health mapping movement worldwide. But the United States is worst in this matter, because, although our climatologists, environmentalists, economists, marketing experts, anthropologists, politicians, ecologists, urban developers, and a host of other scholars in academia, have successfully applied GIS to whatever they do, the financiers attached to healthcare, health, and insurance, have done nothing to make this a part of their collection of skills. There are several levels of expertise and application of GIS that exist for the studies related to medicine. An agency or institution can be an expert in data storage and description, using data to map out people, perhaps apply this to predictive modeling or use it to develop new ways to explain things. An agency may also be an expert is demonstrating and displaying helpful results from the GIS or spatial data. In this case, they use it to show spatial or place-related differences in peoples health, health behaviors, or health related genomic patterns and their presentation in the form of genetic diseases or congenital anomalies. Some case management settings might use GIS unconditionally to monitor, map, present and evaluate the success of their program. They may use it to see where certain services are lacking, where a new office may be needed, where more translators in other languages may be needed due to the changing demographics within the service region for their clinic. Highly competent spatial analysts could use the spatial methods to evaluate how outbreaks are happening. Epidemiologists can use it to explain why a disease like Legionnaire’s spread from Hospital A to Hospital B in just a few hours, and relate this to how it spreads in general across a city. Interventions people can use it to define where the least proactive groups are in their sociocultural settings, or determine who needs STD education more than the rest, or provide a theory as to why new strains of STDs, SARS organisms, and medication resistant Tuberculosis are suddenly forming small outbreaks in a given low income region. Urban developers use it to relate ADD and Autism to lead paint in older developments. Health economists use it to make decisions about what their next plans need to include for spending next years 10 million dollars into new Health IT investments. With all of these quite impressive applications of GIS and spatial analysis for evaluating the healthcare system, we’d think that healthcare administrators would be up on this new spatial methods of analyzing their consumers and financial services. But they don’t. Healthcare administration at the managed care level is the worst part of the healthcare industry when it comes to getting ahead. Unlike the medical climatologists, environmentalists and epidemiologists, they are more than a decade behind in the kinds of instruments a managed care system employs to surveil and manage its patients and teams. Managed care remains a failure when it comes to SMART HIT operations. Managed care is just one step ahead of the typewriter form of EMR management–it at least has computers, most of the time. The NPHG system I developed more than ten years ago (as of 2016) produces unique disease and health related cartographic interpretations of the way public and peoples’ health is. Hexgrids. In the winter of 2003/4, I started this ambitious plan with my use of hexagon grid modeling, as a substitute for the less accurate square grid modeling programs used by all GIS groups. To dated, more than 4500 people access this via just one of my several link pages out there on the internet; one half of these people download my spreadsheet with the algorithms used to produce the more accurate hexgrid modeling grid maps. 3D maps. 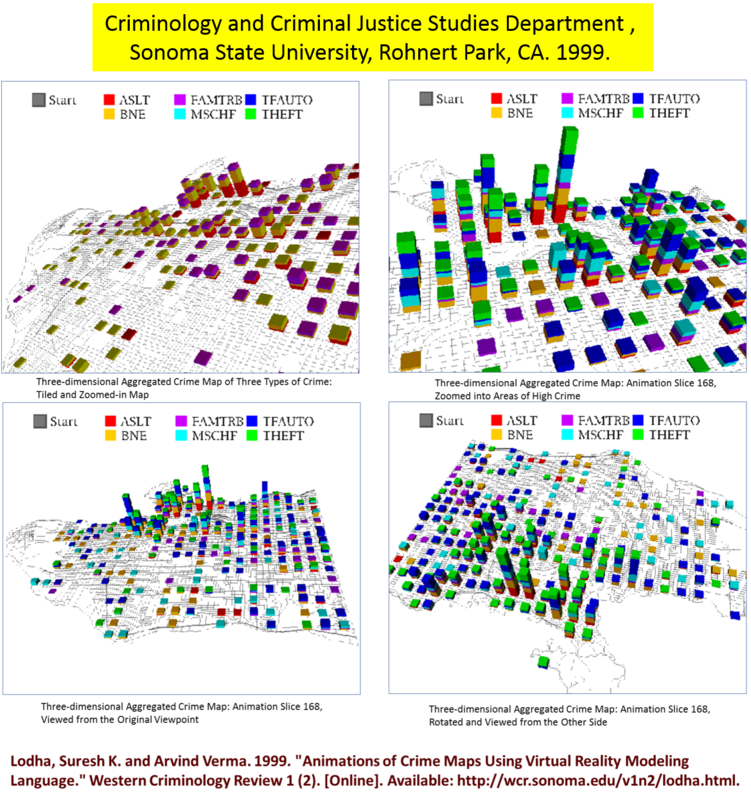 A few years after the Hexgrid was developed, I developed a number of ways to 3D map population health, using centroids (zip or census blockgroups/blacks), traditional grids/spline mapping, and hexgrids, in single and multi-tiered (layered) mapping. Each of these have since been proven to be effective hundreds of times over. US Disease In-migration Maps. From 2009 to 2013 I produced 3D maps of the US for thousands of the most important ICD9 groups and standalone ICDs, and unique culturally-linked or bound ICDs,, to produce the first maps demosntrating how diseases from Russia, Australia, Western Europe, the Pacific Rim, South America, the Caribbean, China, the Middle East, and Africa come into this country. This is used to monitor cultural influence upon the health of this country. US Disease mapping Algorithm and Videos. The ability to produce disease maps without a regular GIS software tool opened the door for aggressive mapping techniques, never before attempted for managed care (at least in the public sector). The algorithms developed nabled 15,000 to 25,000 maps to be produced per day. These maps could be exported to form or imported into the programming used to produce videos of the U.S. rotating around its center point. I used these algorithms to produce 600 videos of the most important diseases in this country, in terms of uniqueness and rarity, social cause, cultural applications, future outbreak potential. Most importantly, this tool, in theory, can be used by any Managed Care Quality Improvements department or team. Per day productivity using this tool has the potential of 50 videos per desk, per work day, for one employee. Its automated production rate is theoretically infinite. Hundreds of diseases per day can be regularly reported, in computer generated booklets or reports. Surveillance and Modeling Outbreak Patterns. These NPHG tools are capable of producing at least 2,500,000 maps per year in 3D, accurate down to the neighborhood and house level. These techniques have recently been applied to high population density urban settings, with no limitations demonstrated. The grid method relying upon zip codes and census blocks was then converted to house or building lat-long levels of testing. For urban areas, cultural niches and unique health sensitive communities are depictable. These mapping techniques can be used to produce the plan for next year’s healthcare management program, develop new policies, clear new paths for population health review, design more accurately targeted intervention programs. Outbreaks can be monitored live and reported upon regularly. New street drug emergencies can be detected before the news teams are allowed to be the first to depict it on their television, internet or radio videos. Health Prediction, Cost Modeling. Most recently, I analyzed twenty years of population health data and focused on the patterns with which people’s enrollment changes over time. This Cost-Burden algorithm demonstrates how a person goes through life, in terms of health and health behaviors, and can be used to define the path each patient is one in relation to his or her family and genetic history, age and lifestyle history, place of residency, type of work, income level, level of education, last year’s work status and healthcare plan, all of these past healthcare coverage histories. 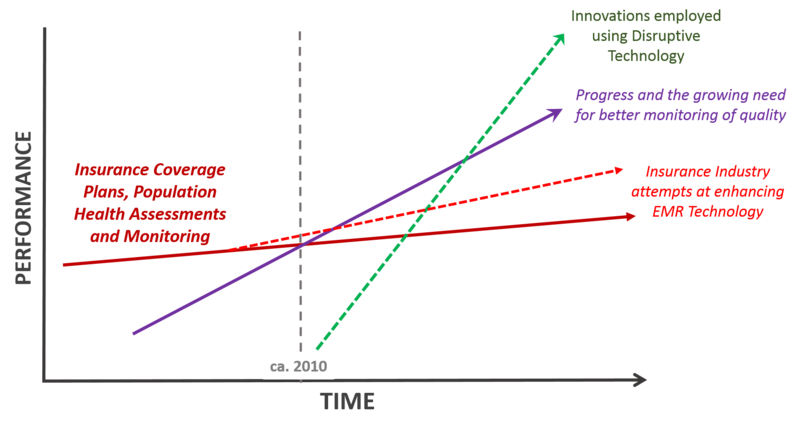 The model shows the obvious, as we get older our risks rise; but it is the rates of rise than can vary between plans. This model relies heavily upon the history of health insurance coverage that appears within a patients claims and billing records. Each person has an upward slope for risk with aging. This formulas defines this equation for individual, groups or regions. It is the first of its kind in exploring differences in potential future costs for care required of different regions, over a 10 to 30 year time frame, using multivariate regression analysis of applied to contemporary on back to decades old historical health care data. My NPHG progam accomplishes all of this without the use of any GIS software. In real terms, using the traditional GIS workstation, it is more realistic than most other forms of mapping developed, using highly expensive GIS software tools. Still, implementing it as part of a managed care program does not mean that traditional GIS programs need to be avoided. 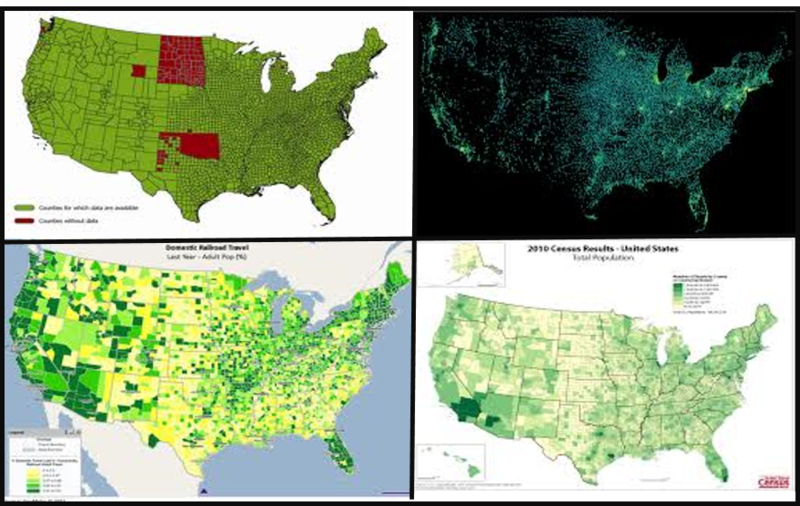 Several spatial analysis techniques and tools need to be made part of the next generation of HIT-GIS generated Managed Care QI systems. Companies have never taken on GIS the way that they should have, beginning more than 10 years ago. This is in part due to poor management by the companies themselves, but also the lack of adequate corporate intelligence. Most big companies are so locked into their routine that they are afraid to take on something that is new and innovative. Now a lot of companies will contest with what I just said. A number of them in fact brag about their innovativeness in their company description found on the internet. But I like to tell all of my students, when you see a company claiming itself to be innovative, the more it makes such a claim, and the more examples it gives, the less likely that company is truly innovative. It may be inventive, but not creative. Understanding spatial health data is innovative. Applying GIS to healthcare work is still innovative and outside the realms of normalcy because companies fail to make much use of it or the techniques attached to producing innovative data, because leaders are lacking in this field for managed care (leaders of the way to produce thousands of maps per day), and because management is not learned in this IT technology, its underlying underling mathematics, or its underlying public health applications and value. Managed care is currently at least ten years behind its counterparts in HIT-GIS technology, like the environmental health, population health, and economic health disciplines. The Cold War of Health Care. 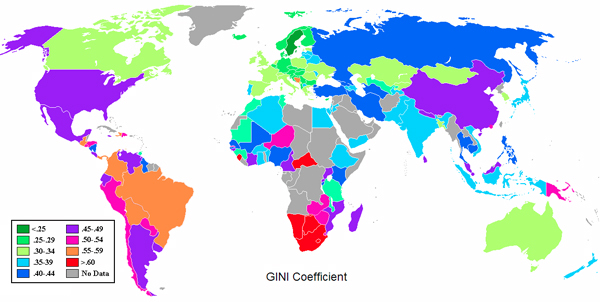 The Gini Coefficient is a measure of socioeconomic inequality. It could be used to manage an area monitored by businesses that provide health and used to develop more cost effective, better targeted programs. Yet, this method is rarely employed at any large scale by a program. The time requirements for data gathering to generate a successful Gini metric are minimal in terms of overall risk. Companies that do produce some sort of SES metric do little to employ it to its fullest extent. A good rule of thumb with Big Data in medicine is that the bigger your dataset, the more statistics your company needs to be generating in terms of numbers and complexity. A major hindrance for these accomplishments is the unwillingness to develop new skills at a rapid pace, to invest in hardware and software/EMR and HIT improvements, and to produce a more cost effective system that can produce many times more metrics per unit of time than your current system. Either CEOs don’t believe this can happen, haven’t yet considered it, or have associates who don’t have the skillset and knowledge needed to make it happen. There is this bimodal model out there used to define the healthcare administrative systems and its related clinical settings. The USE-IT model, which I employ for my dissertation work on this topic, assesses the skills and values of individuals and small teams within a corporate setting, and their interactions with the management and industry. These relationships are then evaluated to see where the barriers exist between these to levels, resulting in the lack of HIT-GIS production at the managed care level, in a managed care business setting. Poor leadership is the reason the HIT world is only very slowly changing at this point in time. Poor leadership results in workers being unwilling to implement these changes. The leaders of corporate settings are for the most part poorly trained in health, but well trained in finances and businesses in general. And they do not readily know how to measure success in a program once that success is generated. 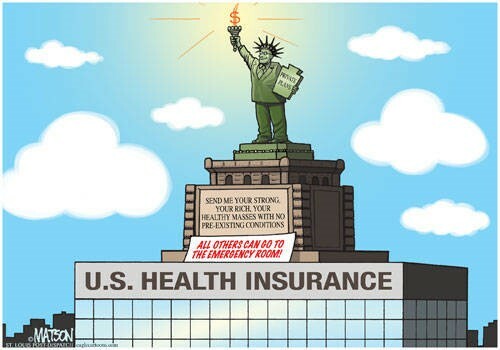 The “elephants” of health care are quickly becoming the insurers, April 2012. For now, companies seem to be satisfied not knowing the details about its data as much as knowing some simple basic outcomes of this data, such as total and average costs, or the information needed to make some predictions with, even if the method being employed is hardly accurate because they haven’t carried out a detailed review of their consumer population, the individuals and families receiving their particular health care product. There are a number of buzz words out there than companies use to try to impress us with their innovativeness. We see terms like monte carlo analysis, heuristic modeling, decision making trees, bayesian modeling techniques thrown about due to their novelty like their a new line of cosmetic or healthy food products. The NPHG modeling tool is what I (and yes I am biased) like to call a breakthrough in how to assess your healthcare information within the managed care HIT-GIS setting. It is a form of disruptive technology. The NPHG modeling tool provides better more detailed, more accurate results that the standard models in pace, and produces these results in such a way that we can intervene with the outcomes we see and make changes at the very small area level with peoples’ health, peoples’ behavior, peoples’ quality of life. 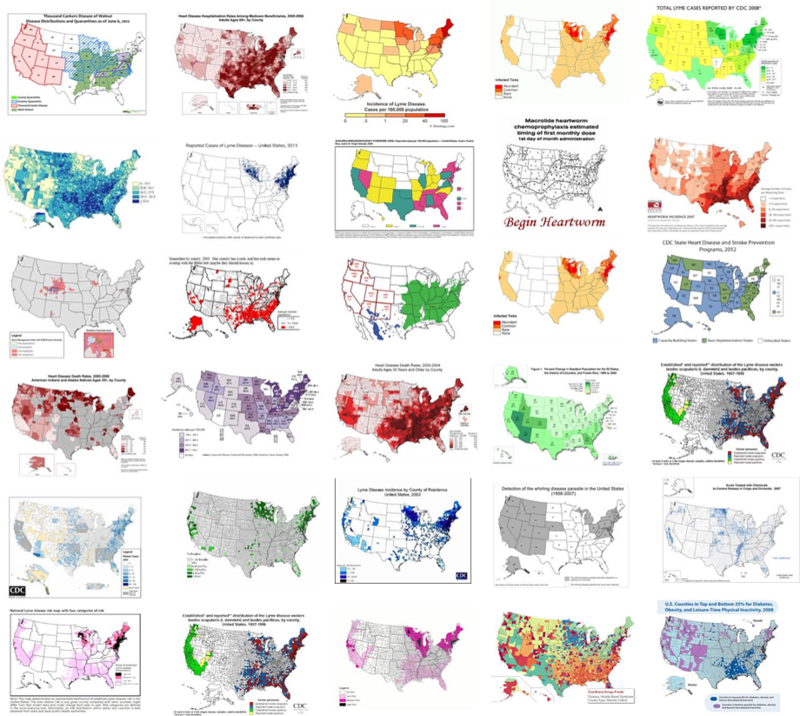 The following are the kinds of maps that other agencies have generated over the past decade. These state and county maps are helpful, but provide us with insights of limited value to the state of health and disease in the nation. You cannot use them to design a new innovative program, and mathematically calculate the success of your program. NPHG programs allow this to happen. For example, if you were a director in charge of establishing some sort of cost-saving, preventive care program using one of the below maps to design your program with, which is the most informative map to you? the one you could rely upon the most in order to determine where to set up your central office, and three or four satellite offices devoted to regions and specific high risk areas? Where are the 3 or 4 greatest high risk areas on these maps, down to the 25 squared areal level? These are the questions NPHG can answer. NPHG makes your program more cost effective, more community health- and people-conscious. Examples of standard two-dimensional GIS use . . .
versus the more applicable 3D mapping technique . . .
Sonoma students produced the first 3D modeling routine with potential for frequent (daily or more) use in the field as a common reporting tool; its video option was a bonus! So what are some examples of what the NPHG system can do? 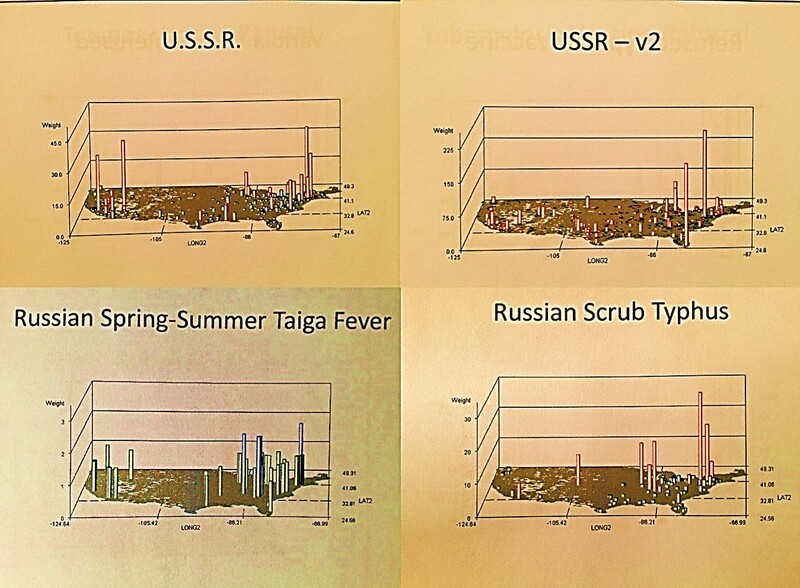 The recent Legionnaires diffusion processes were analyzed by this process. The outbreak areas for West Nile were applied to understanding the more recent Zika virus outbreaks. My international yellow fever in migration maps of the past ten years of cases provides insights into how diseases are effectively crossing international borders and being missed by public health surveillance teams. If you were concerned with how a Russian disease might enter this country, all of the past Russian diseases that came to this country have been mapped. As well as Japan, Australia, etc. Zoonotic diseases that kill expensive race horses are analyzed and their points of entry defined. The places where new drug-resistant STDs and TB outbreaks are happening have been documented. V-codes related to quality of life, such as homelessness, lack of belongings in the household, runaway related homeless can be mapped per region, nationally or at the urban-suburban level. The local muslim and lowest SES districts can be identified and areal isolines or spline diagrams of these unique forms of cultural identity produced . The places where lay healers, voodooists and curanderos are most likely to substitute for or interfere with regular medicine are mappable and linked to neighborhood intervention activities. Death and survival rates, and average longevity per region can be mapped, by religion, race and ethnicity. Using the Religion Algorithm I developed to analyze health practices relative to disease history and quality of care, particular mental health and behavioral health population features can be evaluated and new programs established, such as for child abuse, sexual abuse, spouse beating, gun related accidents, street violence, crime, and adherence to medical advice or procedures. Multiple disease status can be averaged for sections of a region (based upon my Cost-Burden analysis algorithm). Regular reports can be regularly generated on any of these topic, using any of a dozen or more spatial presentation processes, resulting in an “Atlas” depicting your company’s managed care program. The lack of use of daily GIS or NPHG methods by the majority of leading health insurance companies results in their directing the costs for health care along a costly path with an unpredictable future. There is ample evidence out there demonstrating the 3D mapping is not only useful, but indeed has applications to the studies of regional economics, including health economics, and regional health, including program planning, cost, patient engagement, and disease. The NPHG program presented here enables us to better understand popualtion health down to the small area level. It allows us to more accurately target our activities, and it provides more details than the current 2D standards produce. The resolution of these results are much greater than those presented using the older 2D methods, enabling clients to make better corporate decisions about how much money to spend, and when and where to spend this money. So why don’t health insurance, PBMs and other big data companies use this technique? Yale University, 2009: the development of a potentially reusable tool in the marketplace for daily reporting of global 3D data, again with video options (rotating earth). Examples of Application . 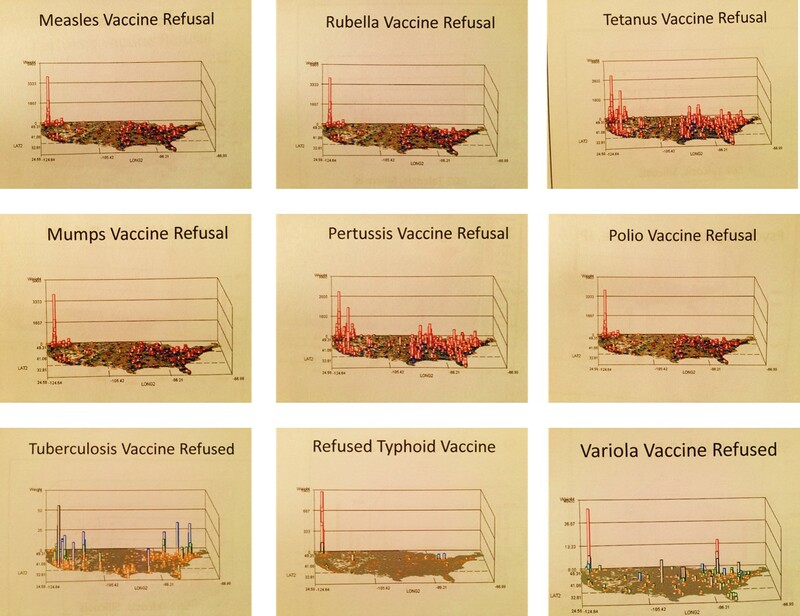 . .
Immunization refusals – Left: traditional 2D “flat-mapping” results–retrospective with limited prospective options. Right: 3D gridmaps, which enable you to precisely target your communities and define your next moves. Which of the above two options (left or right) would you use to produce an effective, well-targeted, cost-saving intervention program? Assume that you could only set up 8 satellite offices for your program (nationally, or just for Washington); pick 8 sites for each of the two maps on the left (excluding Alaska and Hawaii), then compare these selections with those inferred by the data on the right maps. Which one (left or right) is more informative and has a greater likelihood of producing good cost-effective outcomes when choosing where to set up your facilities? So why hasn’t the health care field picked up at all on the applicability of GIS to Big Data, EMRs and the ACA? The reason the health care field has not adopted this GIS technology and logic is simple: leaders of corporations are either unable to recognize its potential or unwilling to pay any special attention to its value. They fail to see how it applies to their industry, and they lack the skillsets needed to realize or catch-up with their understanding of these needs and potentials. They are what the business community in general call “expendables”, a new breeds of Managers on up to C*Os that now hold important positions in many big business settings, and whom need to be replaced for any significant growth in the company to take place. Such a behavior is a normal human reaction to innovations, and the tendency for C*Os to fall behind is also why the disruptive technology exists, and why it takes place. 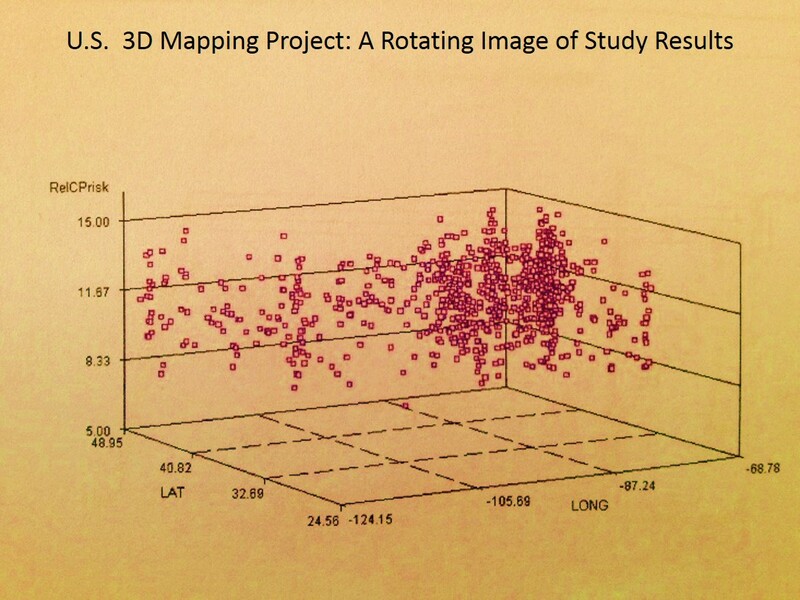 According to studies in business psychology, this 3D mapping technique could be interpreted as an example of disruptive technology, currently in its “embryonic stage” (a term the experts use). It differs from the tradition and is therefore not well supported. Visually, it saves time and money, and is more effective, more encompassing, and more productive. Based upon recent responses I have had with this technology, it appears there is a need to employ this approach as a part of traditional information mapping within the business world. Too often we depend upon the traditional methods, generating the same reports using the same methods that we have employed for years to decades, in spite of their limited applicability to the real world. When it comes to evaluating costs, we want a number to based our decisions upon, and hope that it is right. When it comes to intervention and preventive care programs, we turn to cost to base our decisions upon, making intervention and preventive care program activities the first victims of our common risk taking procedures, focusing too much on cost and guesswork. The following are examples of applications of this method tested years ago, retested several times in different datasets (including Big Data), that excel in value over the current processes in use. This method can be used in any productive, well-prepared system capable of Big Data Management, Big Data Analysis, and Big Data Application. In essence, there is no reason these methods aren’t already in use by Big Business, except to blame these refusals on lack of foresight, poor management, and lack of progress. The above map illustrates the value of 3D mapping. This cluster is instantly proven using the algorithms that were developed. A cluster was first demonstrated via the krigging isopleth results generated (not displayed). A decision was then made to focus on the cluster of cases to see just how isolated they were. A second run was made of this data, focusing in on the cluster region. The nidus for this cluster was identified as a distinct, region in the middle of the south shores of New England, close to a given urban setting. This knowledge could then be used to design an intervention program for this region and the surrounding perimenter. Prevention activities can be better defined and funding determined in terms of where to begin and determining exactly how large of an area needs to be covered. The map provides evidence for the need for more aggressive prevention and counseling programs in specific areas. The map suggests the need for similar studies engaged in involving other conditions or diseases within this ICD class. This example demonstrates the value of regular (annual and ongoing) surveillance techniques and applications using GIS tools; hundreds of ICDs can be regularly monitored and evaluated on a monthly basis. The National Population Health Grid maps tell you everything you need to know to make measurable changes in a system. These three-dimensional maps break down the larger regions into smaller areas that are much easier to work with. They show us exactly where the largest and smallest risk areas lie, and how these ridges and valleys compare with each other. You can compare this data with other GIS data as well, providing even more insights into high risk areas. 2D Informational Maps of the US. Sometimes statistics are included in this information, but only occasionally do they enable us to understand small area distributions or the continuous distribution of behaviors and outcomes spatially like NPHG. NPHG displays the exact target areas for whatever processes you need to engage in. NPHG makes it possible to target more accurately and see the cause and effect or your preventive care programs. By adding a third dimension, you make your outcomes understandable. If you want, you can relate this 3D modeling technique back to the more traditional 2D modeling techniques, in order to generate reports for management to relate to. You can also normalize this data or age-adjust and then relate this to the standard 2D portrayal method as a 3D image as well. In other words, unlike the standard large area reporting methods now in use, the 3D process tells you where to intervene or change your spending. With 3D mapping you know where the sickest neighborhood is and where a new clinic has to be built to treat specific diseases better, impacting people as well as communities. When people see and use 3D maps they see something normally missed with 2D maps. They see where they have to perform their needed monitoring and intervention processes, or where the first surveillance teams have to be placed, or where the most money has to be spent to eliminate the problems at hand. 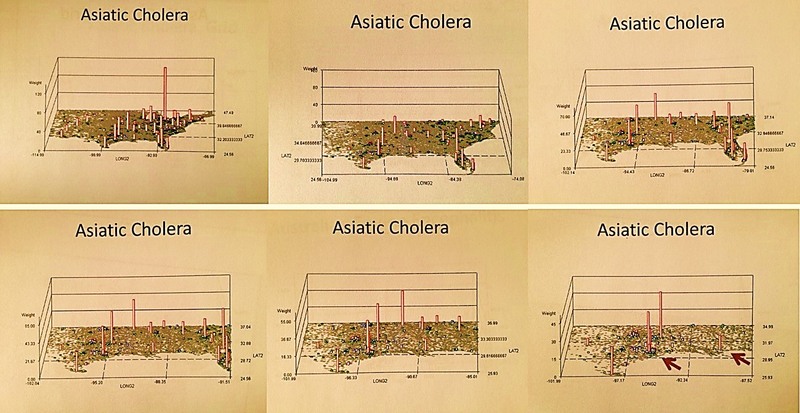 An NPHG Map of unspecified versions of Asiatic Cholera, combined, as the distribution of this disease relates to the US at the Delta of the Mississippi, where the natural ecology requirements of the vibrio responsible for cholera persists, depicted as a series of maps closing in on the nidus for the Oregon Trail epidemic of 1848-1853. If you were a project manager responsible for starting a grant-covered preventive care program, and you needed to pick a place to begin an intervention for any one of the following potential projects, which of the following methods of mapping tells you the msot about how to spend you money and where? With the 3D model, you have a place or set of places or regions to focus on, and where to guide your initial follow up research, identify the place-specific barriers that exist, and perform your first intervention processes to eliminate these barriers. With two dimensional mapping, this detailed, targeted approach is not possible..
Three of the above are large area surveillance results. The bottom right is the 3D small area modeling routine. Large area health findings are interesting, but they are an end point to a project. There is little we can do specifically based upon the three maps that are presented with this data, except decide where to go next for further review. The fourth example in this set identifies for us specific small areas that may be considered targets for research, analysis and interventions. This latter approach wins out over the others in terms of pre-post analysis and the ability to win with a grant proposal. We can also use this NPHG technique to predict where certain problems could arise as a part of the public health surveillance system. They can be used to monitor in-migrating foreign diseases, analyzes terrorism activities taking place by location, gender,and age, and we can use it to social issues like child sexual abuse, or determine where suicides are most likely to happen, or where the next Columbine event could take place (very unlikely however). The way of predictive modeling has been around as long as GIS, but became especially fruitful during the mid-1990s. Its limitations then were the programming methods established, the availability of data to test it with, the speed of its ability to carry out such tasks, and the presence or lack of knowledge in the skillsets needed by people to perform these tasks.
. . . for every company out there that is innovative, there are 19 that are not; for every company out there that is innovative and productive, there are 99 that are not. Very few of the companies out there that claims to be innovative, may be innovative in one or more ways, but in terms of disease mapping and GIS, 99% or more are not engaged in this process. 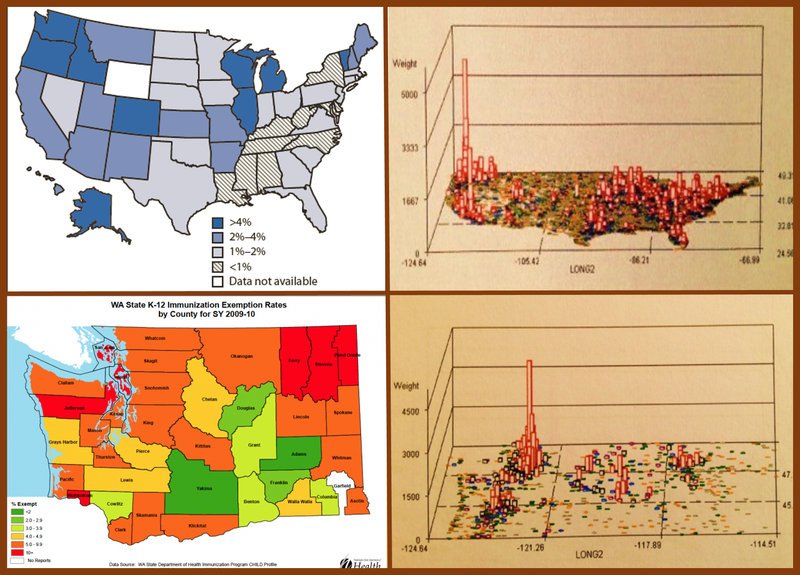 In the above four maps, the top left is national statistics of immunization refusals by state, which is reported on the web; county versions of this map are commonly produced as well. The above right is a grid mapping result demonstrating where the peak in this behavior is. The two lower maps are close ups of the Pacific Northwest, where the focus exists. When national population health is the concern, flat mapping is outdated and cannot be used to design intervention programs, determine target areas for interventions, locate sources of outbreaks, make accurate predictions, prevent disease in-migration, or produce effective homeland security programs. We can apply the above maps to a national or local program. Compare the outcomes from this mapping technique with the upper left flat map. NPHG tells us where to begin our intervention, where the least compliance exists, where the most money should be spent relative to the numbers of patients. Percentages are not used to determine where the costs savings should occur, consumer or patient related needs define this for us. The places where most of the refusals to immunize children are taking place is our focus. With NPHG, anything can be mapped like the above. Cost can be mapped. Age-adjusted prevalence can be mapped. 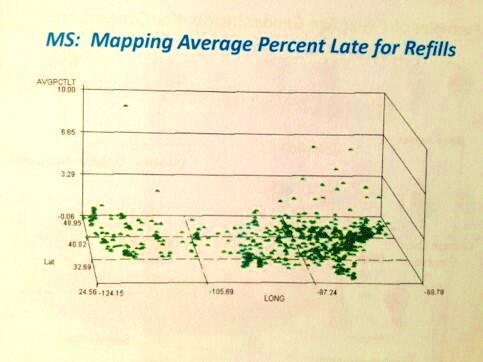 Average rates for the use of local hotlines can be mapped. Malnutrition can be mapped. Outbreaks of foreign born diseases and the in-migration of disease causing organisms can be mapped. .This video is a scan of a condition linked to Mexico, due to a bacterium closely linked to the spirochete Treponema pallidum, which also causes syphilis. One major goal of this video was to demonstrate the ability of the imagery to be moved in all three directions and for the basemap to be tilted at varying angles. It also demonstrates the different subtypes of Pinto that exist in this country. This scan demonstrates clusters of subtypes, as defined by the ICD coding of the areas. No background map was displayed. Fly-overs were also produced for the nation, focusing on several of the clusters. The example of NPHG mapping demonstrates the unique values of this tool for surveillance, scanning the nation in predefined routes, and the ability to zoom in and out and change view angles to focus on a more localized query of a case cluster. ICDs, claims, ER events, V-codes, and other documented data about medical care can be mapped. Clusters of infrequent to rare conditions, or the most socially and culturally diagnoses and codes for spouse abuse, suicide (by types), drug abuse behavior, smoking and drinking, hereditary disease, culturally-linked and culturally-bound disease, foreign infectious and non-infectious diseases entering this country can be mapped. Hundreds of other infrequent, occasional and sometimes common ICDs of interest to public health can be mapped and added to our intervention programs. 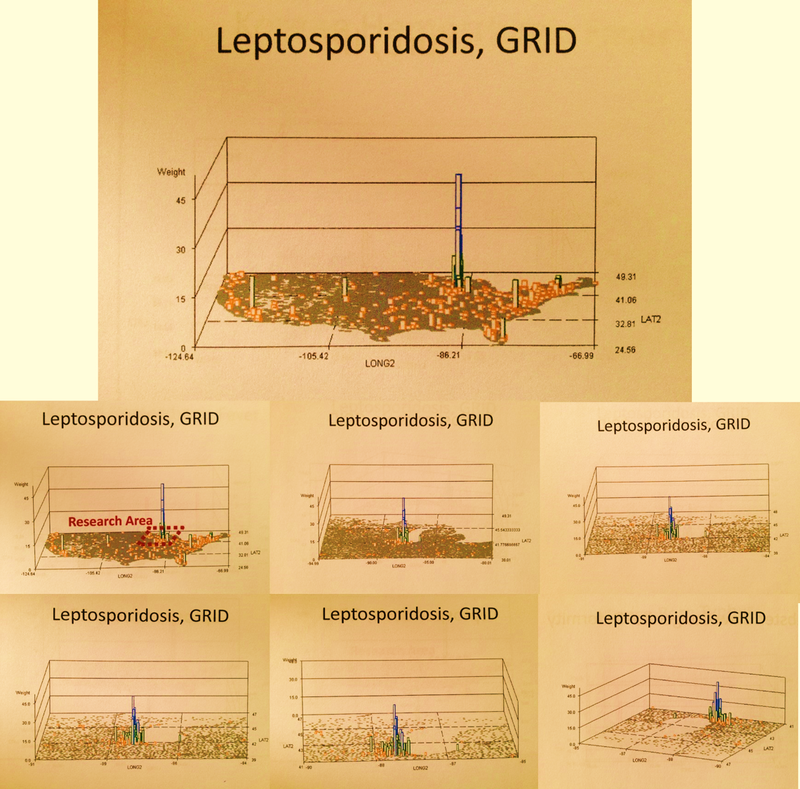 For the above ICD mapped, we can tell that leptosporidiosis is also known a “Chicago Illness” for a reason. This is not always the case for diseases. Lyme disease is named for Lyme, Ct., but originally came from Sweden. St. Louis Encephalitis is caused by ticks that reside throughout the country, not just Missouri. The traditional programs that are out there right now cannot do this mapping as rapidly as NPHG. One can of course do this mapping in any GIS, but to produce 20 videos a day, requiring 600 to 1000 images of maps per video, 12,000 to 20,000 3D map images per day, is not easily accomplished in most other systems right now. This method can be use to develop a reporting method covering dozens to hundreds of diseases per day on a regular basis, printing out report on these topics. With teradata, eCloud, and the most basic of software tools available, the above tasks can be repeated by anyone. The trick is producing the algorithm. Various ways of mapping the traditional Muslim African Practice of Infibulation, a highly controversial cultural behavior that entails closure of the female genital organs in younger, unwed women. Detailed reviews of the US cases reveal 4 peak ages for entry of this ICD code into the EMR, with peaks in the childhood and teen age years suggesting possible performance of this activity in the United States. The following is a unique example of how this method helps us uncover things previously unknown about particular medical or health related behaviors and conditions. African practiced infibulation by age-gender over the past ten years is a controversial topic. So too are the events identified by V-codes, for detecting highly sensitive criminal and abuse related medical events. A decent video requires at least 360 images, twice this amount is better. This is the minimum requirement for producing a rotating imagery product with a satisfying view. Such a video provides it viewer with insights into a disease that no other method of disease mapping can duplicate. If we consider the health care industry solely as a form of business, we can relate people to potential revenues and apply traditional corporate planning techniques. Services have to be placed where the greatest numbers of consumers are. We try to do this in health care by establishing community centered offices and clinics. With NPHG you know exactly where the needs are and can better plan your office locations. 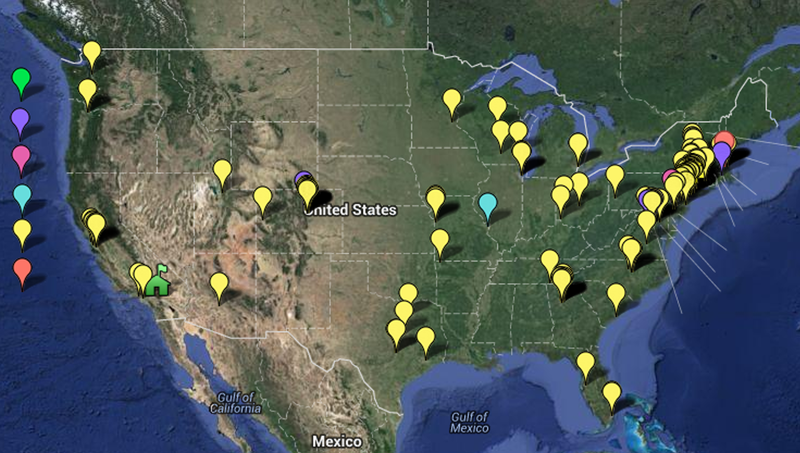 In the above video map, we see where the greatest number of homeless reside. Since this is national data it probably represents a decent transect of the overall homeless population in the US. With these results, we can choose the exact areas for setting up new facilities. If we had used county data, census records, or some other dataset for an irregular polygon area, we would still have to depend upon the local community to learn where the most impacted areas exist. Even then, we could very easily miss the main location for this social problem and the related public health issues related to the homeless lifestyle and health of the people. Such a visual representation tells you exactly where problems exist and where to begin your interventions. Whereas a 2D map tells us similar information, we cannot use it to define the focus of where to begin our intervention program, where the problem exists. NPHG eliminates the need for costly reviews that may have to be engaged in for further health care planning. By eliminating the need for standard base-mapping routines, producing maps takes only a couple of minutes. It took me several times longer to merge the images into a video than it took to produce them. The technology exists, but it is not in place. By mapping hundreds of diseases per day, thousands per month, for dozens of metrics each such as counts, prevalence, first time diagnoses, age, cost, service demands, positive lab results, lack of compliance, socioeconomic status of highest risk age groups, one can in theory monitor the spatial population health nationally, regionally and locally. 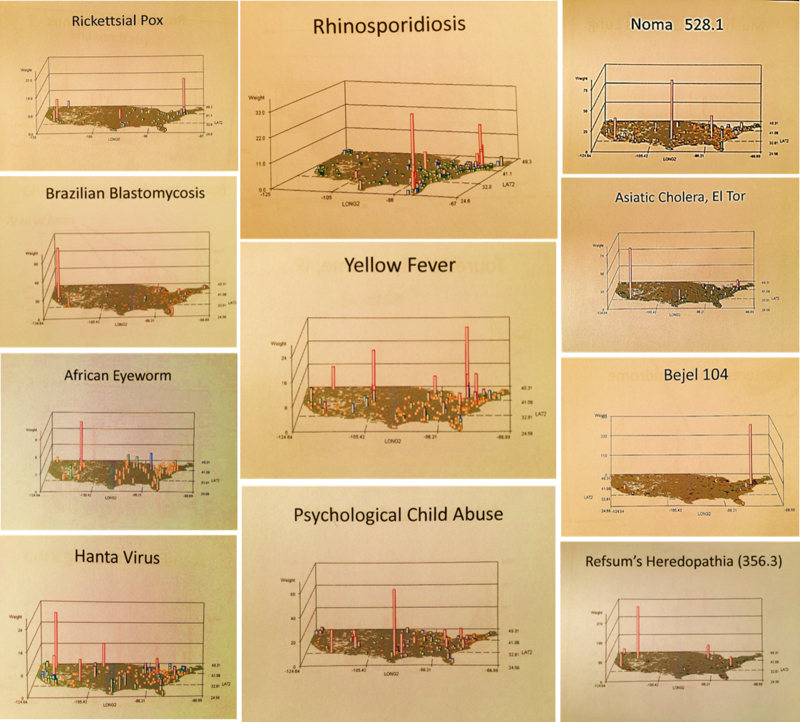 The above maps depict disease niduses or “hot spots” that were detected using this technique. Some are environmental, biological and/or ecological, others are cultural, sociological, psychosocial, and/or defined by health care industry resources. Of course the very first 3D rotating grid videos were crude and rough (none showed here), and not at all pleasant to watch turning around on the screen. So, I fine-tuned the resolution of the imagery and grids, eliminating some of the excess by altering the programming technique. Merging several traditional algorithms enabled me to develop a technique not mentioned in any books. This resulted in a 3D map that could be reviewed up close or from far away, honed in on, or views by fly-over, at any angle, any resolution, automatically reproducible at a rate of hundreds to thousands of map images per day. Next I had several presentable ways to illustrate the results of this routine. I added a modifiable grid cell size calculation routine and once the imagery was perfected, produced case analyses using the case data only. I later re-inserted the base map into this without need to use actual GIS data sources (arc-line-polygon files). Point maps were first generated, followed column or pillar images. I then added a krigged density mapping protocol for a flat plane projection of results, adn then developed the algorithms for scanning the earth’s surface as if some surveillance purpose was in mind for the analysis. Examples of this process demonstrate “hot spots” or peaks very well. Their detection was in fact improved greatly. The status of this disease mapping field in the public sector of medical GIS, right now, is as it was back then. Companies don’t to see a value in this technique for mapping the US or its large areas and urban-rural relationships, or the relationship of these findings to local environmental information. My newer techniques focus on small area grids, with the purpose of producing targeted, highly specific maps on health and disease. County and state maps, and certainly not the large area regional maps don’t make it possible for intervention programs to be easily developed. With NPHG you can more effectively target people when dealing with population health matters. With NPHG it becomes possible for you to develop programs better designed to meet specific local needs, culturally or income inequality wise. You can implement such changes even down to the square mile or city block, planning that, again, cannot easily be done using the standard processes in place (although census block comes close, as well as block groups in urban settings). NPHG also provides the means to engage in surveillance of hundreds of infectious diseases on an ongoing basis daily to several times per week. There is a survey I wrote up in 2010 which was placed in Survey Monkey, followed by a more targeted in active enrollment of participants that I engaged in due to low response rates. Companies were queried directly via C*O emails and some person-to-person reviews by telephone, or they were queried indirectly by way of other formal processes. More than 200 companies considered “big” to the industry and which were actively engaged in what the company termed “innovations” were contacted. A total of 154 major companies with “innovative” programs, high patient counts and high presence in the national business community were evaluated for the following regarding GIS: familiarity, ownership, knowledge base, active employee engagement, employee education background, publications proof of engagement, self-acknowledged corporate utilization, and survey produced ‘business technology spatial IQ’ results (knowledge of presence, potential applications, how to use, actual employment, degree of employment, etc.). Company types included health insurers, very large often national care providers, quality assurance companies, health or business information analysis companies, overseers of these agencies or companies, several very high end combined university/teaching hospital settings/insurance providers involved in the field, PBMs and companies similar to PBMs in terms of their business activities and goals (consultant firms, “partners”, etc.). 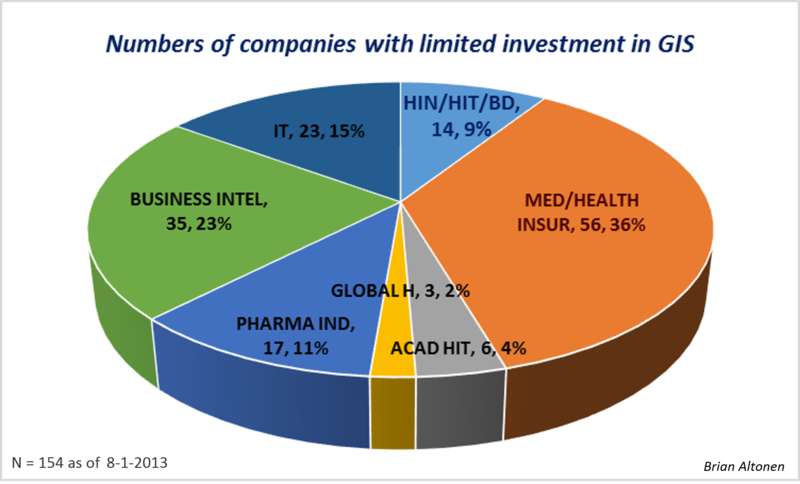 My findings indicate that the no health care groups/companies are fully engaged in GIS, with the exception of one HIN/HIT/BD member. The HIN/HIT/BD group consists of businesses that claim active management at all levels, with a very high count of population or clients that are regularly contracted. In theory, these are the Big Data companies that we’d hope were fully engaged. Unfortunately, only one of the 14 engaged in regular use of Epidemiological GIS lacked the technology or software capability required for full scale engagement of this population health surveillance process (high rates and high counts of end products, reporting to dozens of companies per years, with hundreds to thousands of maps and reports). More importantly, such uses were indeed regular and active (engaged in weekly) but were not highly productive (no multiple reporting, no interventions developed as a result, no reporting to multiple clients with GIS results on an annual, limited applicability). Essentially this means that no regular reporting and/or epidemiological surveillance programs could be found at the corporate/public health industry level as of 8/1/2013. In the following examples of this new technology, we see the value of these techniques. 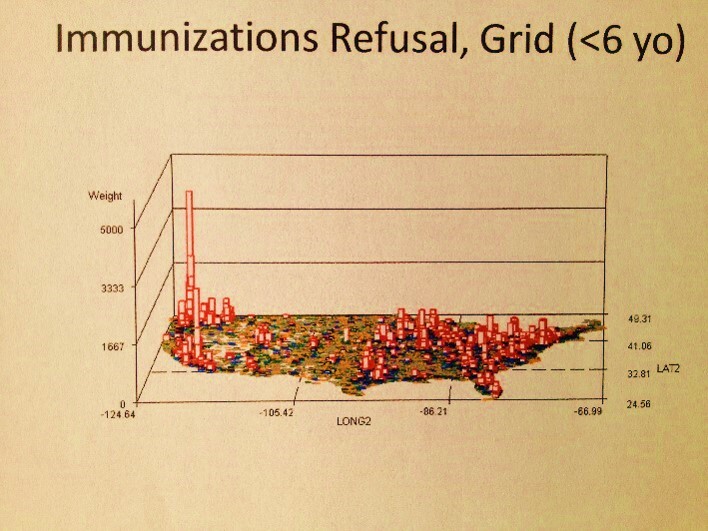 National immunization refusal rates, up close. Pacific NW is first in rate, with Seattle > Portland, followed by Southern California, and then perhaps the Midwest and parts of the NY-PA-CT area. This however has little to do with most childhood immunization HEDIS and Quality of Care studies that are on-going. It also does not tell us where the rarest, most fatal diseases for which vaccines are available like Small Pox could prevail. The above figure is an example of the kind of mapping this technique can do. It is of the number of cases registered as EMR data for the US, broken down into approximately 2400 (60 x 40) grid cells, each cell presenting as a 25 mi x 25 mi square, with about 1600 of these cells representing the United States continental proper. There are two major peaks in counts noted on the above map: the Seattle-Portland area and the southern California area. This technique was employed for each vaccination type and then all vaccinations together, with types of immunizations refused identified using V-codes. More than one v-code may be entered to represent refusal on just one vaccine. 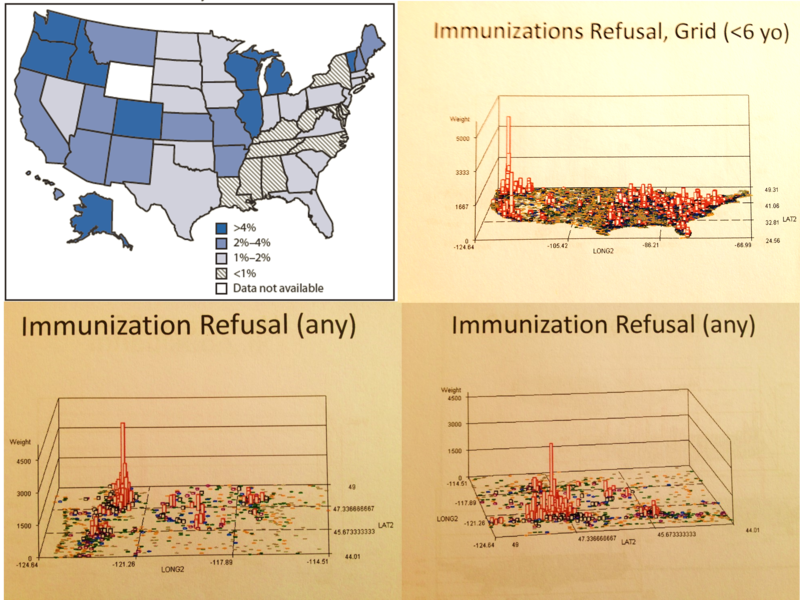 These claims were mapped separately, and then grouped together and the individuals mapped for refusing any or all possible immunization refusals. The above series demonstrates the value of rotating imagery. You can see the same data from varying perspectives and be able to pinpoint your problem areas–those areas in need of a more focused intervention program. This mapping process has as its major advantage over traditional GIS the fact that it works very fast. It time and cost saving abilities are it strengths, for now. This will of course change as the Cloud and technology improve, and the ability to utilize traditional GIS base-mapping becomes possible for programming the product of a total ICD defined disease surveillance per day, for large or small areas, for all possible diagnoses and diagnoses groups. At such speeds, this mean you can also focus on certain places, like the Gulf of Mexico, or the total west coast shoreline, or the Great Lakes area, to monitor potential in-migration patterns for potentially fatal foreign born diseases. You can also program a sequential scan over the surface, row by row of states, from east to west, west to east, or north to south, honing in on cluster areas as I display in my video on Occupational Lung Diseases and another on Allergically induced bronchitis. . For the time being, this technique eliminates the need for an expensive, time consuming, time limiting regular vector GIS techniques that are out there, where costs are a concern for smaller non-profit groups, where time is a concern for daily anti-bioterrorist, anti-disease penetration homeland security groups. El Tor Cholera–could it return? This is the deadlier form of the disease commonly crossing into U.S. territories and states. This video shows four spatially defined insights about its behavior. Its primary route of entry is defined by population density, and New York is most susceptible due to this feature. But it has ecological methods as well, which the nidus or peak in southern California displays, probably of a temporary nature. Then there is in-migration and the return to tourists from Mexico, a major route of concern due to large numbers of other diseases that enter via this route. This risk demonstrates the need for surveillance and effective disease tracking software. An unexpected port of entry for diseases demonstrated on this map is Chicago. This recurs with other in-migrating diseases, such as yellow fever. We expect yellow fever to penetrate via southern borders. These findings suggest our guard is down, especially along the northern border of the U.S..
My theory is that without GIS, this spatial analysis technique is more valuable than the current technique (aside from the more sophisticated tools developed in Homeland Security office settings.) This technique runs 100 times quicker than most–spends at most 40 minutes of time (5-10 minutes for most of my maps if run in Teradata), versus the 30 mins to several hours required for running the same using a GIS at home or at a workstation (these numbers are rapidly changing however). An automated method requires minimal manpower to run, once the specs were figured out, meaning a productive company could produce one to two hundred maps per day, and place them into a reporting tool, if that company was both mapping and computer savvy. As examples, I workout applications of this technique to producing daily reports on the spatial behaviors of bioterrorism disease (ca. 250 ICDs, 28 map per figure, see below) and of certain SES-cultural disease patterns. The current productivity of this method is about total of 25 x 600-1000 maps or 15,000 to 25,000 maps per day. This method makes it possible for us to engage in weekly, daily or even live data reporting of hundreds of medical diagnoses, conditions, behavioral facts, financial matters. For example, the following series of national data on the homeless took at most an hour to produce (7 series x 5 mins is actually 35 minutes), using just a single run. In theory, this method of disease mapping cuts workload/manpower by 50% or more, freeing up time for those people to make better use of our resources and explore new uses. It also enables us to engage in more detailed, broader spatial reviews of population health that need to be developed and implemented, such as projects focused in the incoming routes for diseases via the Great Lakes, Boston Harbor, New York City, Philadelphia, Washington DC, Savannah, New Orleans, Los Angeles, San Francisco, Astoria, Seattle, etc. This next series, the maps for which are above, came as a result of a recent test I did on for mock homeland security project related disease spread study, a results of multiple calls from several agencies trying to secure contracts for this work. This first time through, I found that this process could be used to manually evaluate (a much slower process) and report on about 20 diseases per day, producing about 20-30 reports, for example on the diseases brought in from the Orient, or from Middle and South America, Canada, Africa, and Australia. The annual northward migration through the US of tropical diseases that require mosquito vectors, the re-emergence of lyme disease are interesting, but don’t compare with the possibility of the US being invaded by more controversial diseases like Texas Fever, Russian Taiga Fever, a potentially deadly hemorrhagic strain of vibrio, and a list of 200 other diseases not natural to the US and with the potential for in-migration and deadly consequences. Chicago Blastomycosis Video, local Great Lakes region evaluated; video developed for educational purposes, with N, N-squared and N-cubed 3D GIS results compared. Example of Bad Survey results (left) and Good survey results for an annual Quality of Care report, based upon the reliability of the satisfaction surveys handed out following each health care service that is provided. With the NPHG mapping routine, one can essentially monitor hundreds to thousands of diseases, V-codes and E-codes per week, assuming this data exists in the Electronic Medical Records [EMR] currently in use and the institutional hardware is capable of managing such a process. One can also use these results to produce a report depicting the outcomes of surveillance in the form of a 3D cartographic image of the regions being evaluated. The examples provided here for the most part depict results for the contiguous United States. In the following study I did a comparison of a culturally-linked ICD to what I considered its equivalent American ICD. I based this judgement of similarity on the very similar age-gender distribution for this purported heart disease, that seemed to mimic a American psychiatric condition more than it did a heart condition related to aging. The contemporary ways in which children and teens misbehave, or worse, can be analyzed using all three forms of data. 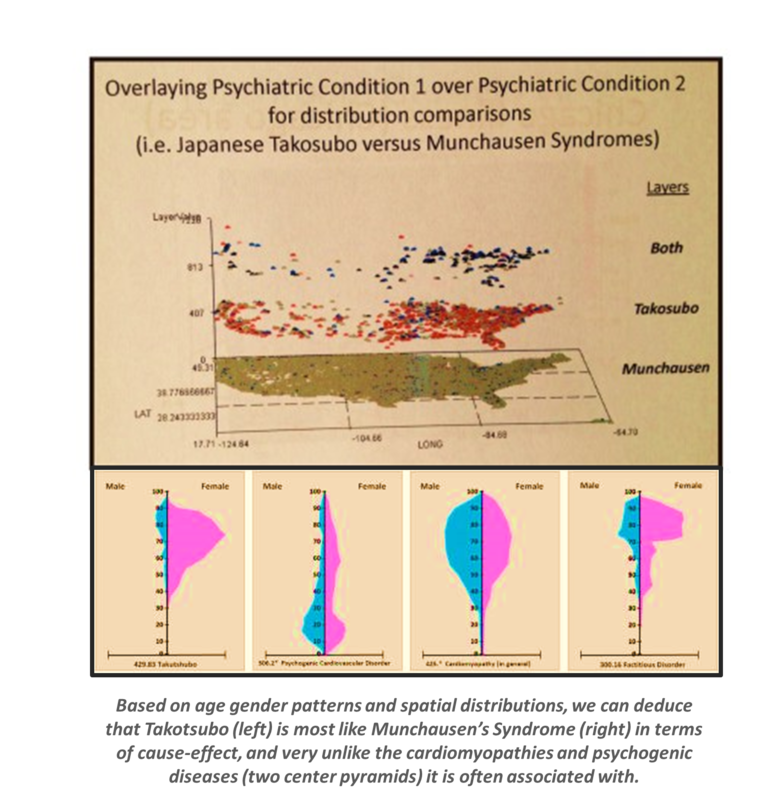 ICDs depict behavioral health and psychiatric diagnoses, V-codes depict behavioral and domestic relationship and habit conditions. Emergency coding (which is called E-coding here), depicts anything and everything related to the need for emergent care. In the following three examples, E979. * means an ER case is somehow linked to terrorism or bioterrorism events. The other two examples pertain to two possible personality disorders related to Columbine School disaster of more than ten years ago. In the following example, venomous bite related claims in the ER records were evaluated for their spatial distribution, to see if they match ecological expectations. For this review, toxic marine Life were compared with venomous snakes claims. A krigged map was then produced (these are often displayed at the beginning of the video’s demonstrated since the algorithm for this was incorporated into the programming. This krigging map corrects for other underlying spatial features and therefore is useful for qualify your final results, defining the reliability of the peaks being observed on the 3D model. This technique can be combined with the 3D mapping to result in maps that tell use where the most problems occur, and where the “richest” or most concentrated areas are. Both of these gridcell values can be used to assign the need for engaging in a new program somewhere. You can decide to develop a very targeted program for a small area, impacting the highest number areas, or develop a regional program that attacks a region, which based on krigging represents a greater risk than the very small point/gridcell regions. The following is an example of how to review these two pieces of information together. 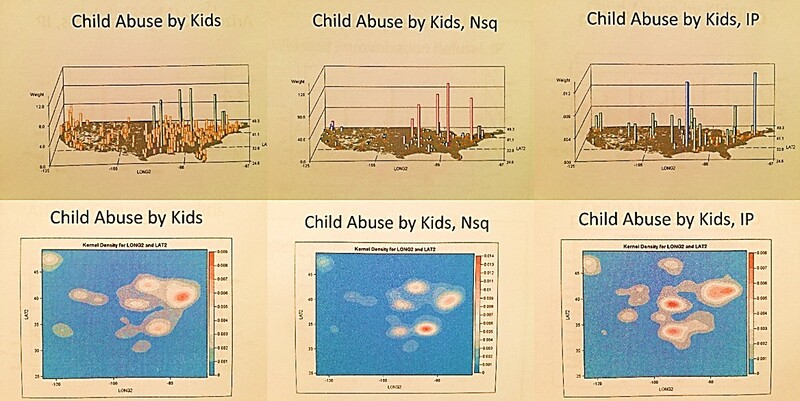 For this example, Child Abuse display 3D spatial models were placed over the krigging maps for comparison, and three ways for reviewing spatial data are depicted–N, Nsq and IP. For a public health topic this sensitive, it helps to validate your responses and verify exactly where the first interventions may need to happen. 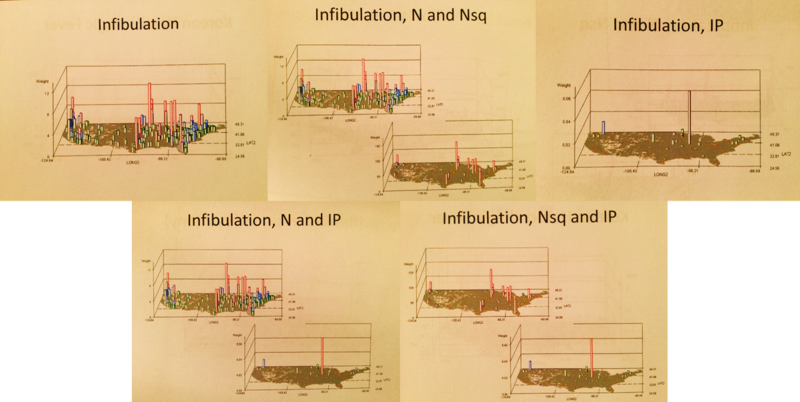 This modeling technique also presents regular data, uses N-squared to make the most important areas stand out, and IP to define the same results once with independent prevalence metrics displayed (cells independently evaluated, not krigged). Turning to the krigging maps then define for you exactly where the major problems exist in the country. Comparing this final krigged IP map with the previous two, defines for us where to engage in prevention in cases were numbers of cases are just as important as their social frequency, an approach I like to call the hybridized approach to planning intervention activities. Other metrics can be hybridized as well, including cost per patient averages, temporal frequency averages per grid cell, and endless other values that can be pulled from EMRs to develop this process further. I produced a number of special pages that provide examples of the use of NPHG. They also demonstrate some of my most useful or unique findings. The purpose of these pages is to demonstrate potential applications for this public health surveillance technique. Knowing the health of people over time and space is far more rewarding and preventative than knowing the cost and earnings of their health care. In the future, the most influential and successful health care industries will focus on prevention first, treatment second, and business-related income third.